The Doogee X5 is an entry-level handset that comes with a fingerprint scanner, and is priced to inflict the least amount of damage on your finances as possible. Now, the Doogee X5 Pro is available. The latter model features the same specs as the regular X5, except for an improvement in the CPU, RAM, ROM and connectivity. The good news is that the device remains affordable. The Doogee X5 Pro offers 2GB of RAM, double the amount on the original model. The chipset inside the Doogee X5, the MediaTek MT6580, is replaced by the MT6735 SoC for the "Pro" version of the handset. This chip carries a quad-core CPU, and the Mali-T720 GPU. We should also point out that the amount of internal storage has been doubled to 16GB from 8GB. Unlike the Doogee X5, the Doogee X5 Pro brings support for 4G LTE connectivity. Doogee also stuffed some useful features into the new model, such as the ability to wake the phone with a double tap to the screen. Users can also draw a horizontal line on the screen to bring up the dialer, and draw an "m" to start the music player. Android 5.1 will be pre-installed. 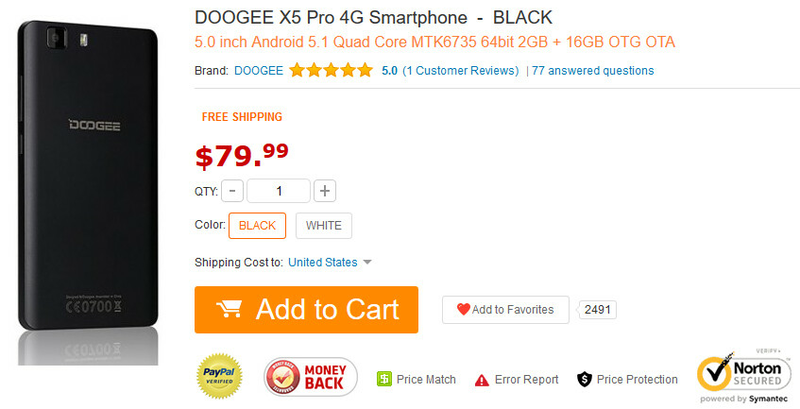 Available in black and white, the Doogee X5 Pro is priced at $79.99.